Truly gourmet dining amid the glory of Newport's grand estates, and well worth the price. : This elegant dining salon, located at The Chanler hotel near Newport's historic Gilded Age mansions, offers a menu that pays homage to the best of the Old World while embracing the new with its six- and nine-course New England tasting menus. A modern and open "show" kitchen greets you as you enter, but the ambience is otherwise strictly French elegance. 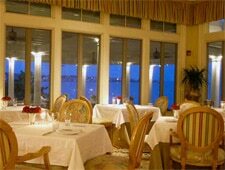 Coveted seats at the back of the compact main dining room afford excellent views of Newport's Second Beach. Dinner courses are artfully plated, from the lobster bisque to a grilled veal chop with cauliflower and roasted porcinis. A potato gnocchi appetizer is delicately braised for a slightly woody, crisp finish; the bordelaise sauce on Kobe beef tenderloin complements the lean, finely textured meat. The restaurant's signature dessert is a trio of miniature spiced pears perched atop rounds of caramel crème brûlée. Dinner at The Spiced Pear is truly gourmet dining, with prices to match, but for an "old money" experience amid the glory of Newport's grand estates, it is well worth the tab.